The shoulder (and shoulder blade) sacrifice stability for mobility, meaning that due to our need to be able to move our arms in many different directions, the joint itself is inherently less stable to allow for more range of movement. 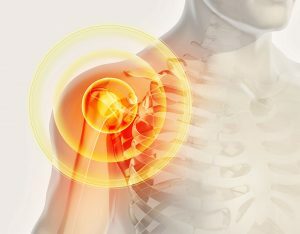 In turn, this means that our shoulder requires much more coordinated muscle activation to remain “stable” and account for the greater flexibility. If we look at the active control system, namely the muscles and nerves, that are responsible for controlling our upper limb, we need to examine muscles responsible for spinal posture, scapular position and shoulder (glenohumeral) joint stability to understand how Pilates can be useful for rehabilitating pain in the upper quadrant, whether it’s due to postural overload, rotator cuff injury, thoracic outlet syndrome, tennis elbow or nerve root impingement- to name but a few. In order for our shoulder blades to maintain correct posture, we must first be able to achieve a good spine position. To demonstrate this, try slumping in a poor spinal posture and elevating your arms straight in front of you and up to the ceiling. Now sit up tall and re-try this in a “good spinal posture” and notice how much further you can raise your shoulders into flexion. This requires adequate thoracic spine flexibility into extension and good neck posture. Maintaining optimum neck and thoracic posture also allows for optimum neural function so that the correct muscles can be activated in the correct sequence. Good spinal posture also opens up the foramen (holes) where the nerves exit the spine. Exercises that emphasize spinal mobility and extensor muscle strength, for example, the plough, breastroke arms or mermaid stretch, to name a few, help to achieve adequate spinal posture and flexibility to allow for good shoulder blade position. The second step to creating good shoulder function and minimize load on the neck, shoulder and upper limb joints is to establish optimum scapulae posture. The sternoclavicular joint (collar bone to sternum) is the only bony attachment that the upper limbs have to the skeleton, hence their reliance on the scapulae and their muscular attachment to the body. The scapulae can move up, down, in, out or rotate forward or backwards and any pull too far in any of these directions can cause shoulder dysfunction. There lies a delicate balance between the upper, middle and lower trapezius, rhomboids, serratus anterior and pectoral muscles to enable the optimum function of the shoulder blades. Following this, it is important that your physio thoroughly assesses your scapulae posture, in order to accurately diagnose which muscles are over- or under-working and to prescribe a tailored exercise program to address the imbalances. Pilates exercises such as chest expansion, opening the window, salute or weight bearing upper limb exercises all have the ability to target certain weaknesses around the shoulder complex. The rotator cuff muscles are responsible for controlling the ball in socket joint that is the shoulder (in combination with optimal spinal and scapular posture). Imagine your hand holding a cricket ball. This is a rudimentary description of the anatomy of the rotator cuff around the ball of the socket. These muscles act to centre the head of the humerus in the socket and control its translation as we move our arms in all directions. Exercises such as external/ internal rotation and sword draw on the reformer provide a nice and challenging alternative to the theraband rotator cuff exercises commonly prescribed to strengthen these muscles. So whether it’s an acute shoulder injury obtained during sport such as swimming or tennis, or an insidious onset postural overload, Pilates may provide an excellent rehab tool when a tailored, individualised approach is applied. If you’ve been struggling to overcome shoulder pain of any sort, what you may need to do is step back and ask yourself if you have been addressing all necessary components- the spine, the scapulae and the shoulder joints. At Q Pilates, our physiotherapists undertake a thorough Initial Assessment to hone in on muscular imbalances and postural contributors to musculoskeletal conditions and develop a clinical program designed to optimize muscular function and reduce the burden of pain on your body.